No matter where you’re going maybe you want a watch that’s less dependent on traditional batteries. Maybe you’re looking for something a little more eco-friendly or something that’s a little more unique. The best solar watches are definitely going to be that. We’ve looked for the best solar watches for sale so you can find something you’ll really love that compliments the look you’re going for. Water Resistant: No matter what you’re likely going to want a water resistant watch at least. These ones will be able to stand up to rain and a little bit of splashing if needed, which can be important if you’re going outdoors. Case Diameter: The size of the watch in question is also something you’ll want to consider. Some people like a larger watch and others want a small watch that will fit better on their wrist. The size is going to be all about personal preference. Warranty: Just how long can you rely on your watch to last? You definitely don’t want to buy something only to have it break all too soon. With a warranty you know that isn’t going to happen and you’re covered if it does. Type: This refers to whether the watch is digital or analog. A digital style is a bit more casual or sporty and an analog is usually a dressier style. Check out this information to see which one is right for you. Strap Material: What the strap is made of will generally be a personal preference, but it’s definitely something that you’ll want to know before you purchase anything. Make sure it’s something that will be comfortable for you. Gender: Is it designed for men or for women or both? The size and style might be slightly different depending on who is intended to wear it but of course, you can choose any watch that you feel comfortable with. With so many different solar watches out there it might be a little difficult to figure out just which one is going to be the best for you. That’s why we’ve narrowed things down to 10 great options and provided you with these solar powered watches reviews. That way, you know what you’re getting and you can count on getting the quality that you really want and need. This watch definitely looks strong and durable and that’s because it is, as one of the best solar powered watches out there. 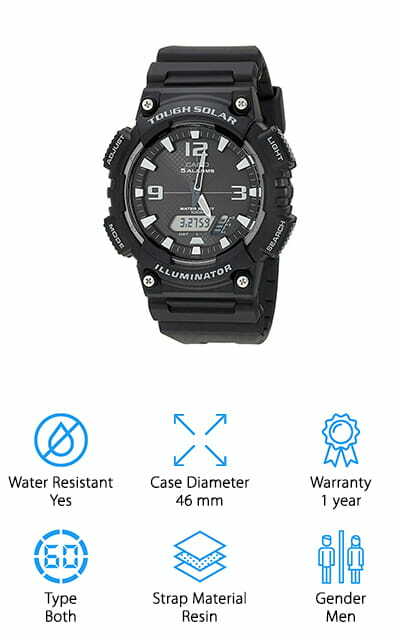 The watch itself is shock resistant and 200 meter water resistant, plus being solar chargeable. That means you can take it with you anywhere you want to go from the wilderness to everyday living. It has 4 daily alarms and 1 snooze alarm, hourly time signals, 1/100 second stopwatch, full automatic calendar, 12 and 24 hour formats, a countdown timer and world time along with full auto EL backlighting with afterglow. All of that means you have plenty of features to get anything done. 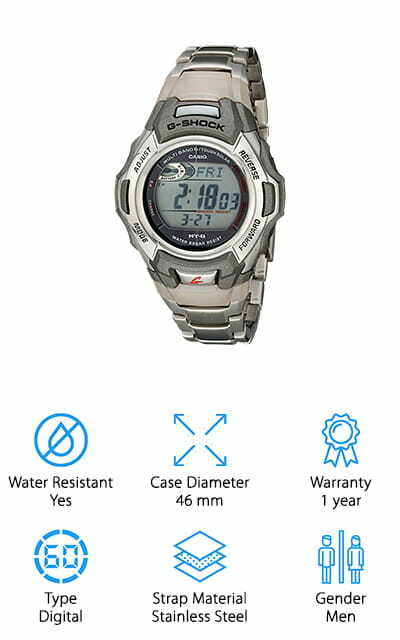 Even though there are plenty of features the solar powered G Shock watches are simple to operate and the battery can last up to 9 months on a full charge without needing any more light. When it is starting to lose power you can see it with the battery power indicator and there’s even a power saving function to slow down your loss. Looking for something cute and fun but still plenty rugged and durable for your outdoor adventures? These best women’s solar watches are definitely going to be a great place to start. It comes in 2 different colors and patterns and features a resin band with chrome top ring. You’ll have an alarm, the clock, lap counter, countdown, 2nd time zone and a military time function. That means you won’t have a problem getting things done when it comes to heading outside. The quartz solar powered movement means you won’t have a problem keeping things accurate and the watch is resistant to water up to 50 meters. It’s lightweight, small and ready for just about anything that you can throw at it with a nighttime backlight and a sleek look for everyday wear or special use. If you’re looking for something that looks simple but in a sleek and sophisticated way then this is the watch for you. 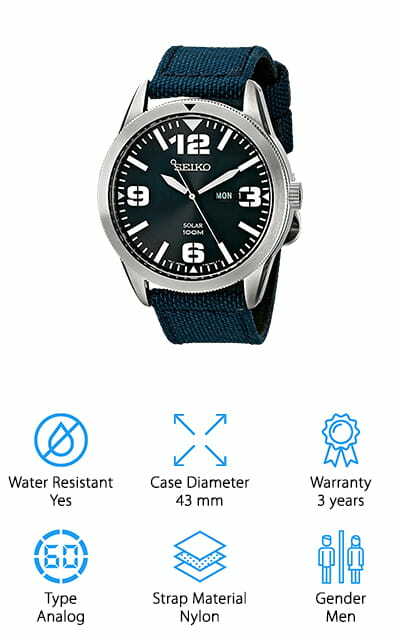 It’s one of the best solar watches for men and it has a sleek nylon blue strap and a stainless steel case to add just the right amount of style. The buckle closure is great to fit just about any wrist and the quartz movement is completely solar powered. You’ll have no problem reading the analog display and it’s even water resistant to 100 meters. That means there’s no need to worry about taking it into the wilderness with you or even swimming. You’ll also have the day and date in the box and the fact that it uses a crystal means that the lifespan is plenty long enough. Because of the design, you can wear these Seiko solar powered watches any time of the day or night without having to worry about a thing. Just put it on and take it with you for normal events or for your next camping trip. With these men’s solar atomic watches you’re definitely getting something that looks and feels durable with 100 meter water resistance, LED lighting and afterglow and neo-brite hands and markers to help you see the time no matter what. It even gives you the world time and multilingual day of the week display. You’ll have the option for 5 daily alarms and hourly time signals as well as 2 countdown timers, a 1/100 second digital stopwatch, 12 and 24 hour formats and full auto calendar. The solar battery fully charged can get you 10 months of power with no additional exposure to light. This moderately sized watch offers you both analog and digital time as well as a resin band and case. 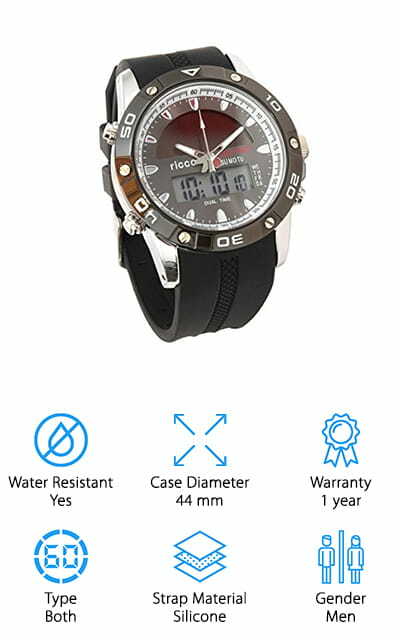 Water resistant to 100 meters, this watch even gives you indicators about the battery life. These ladies solar powered watches definitely look sleek and elegant so you’ll have no problem wearing it to your next formal occasion. Made with silver toned stainless steel, it features a black dial and crystal accents through the bezel. The Japanese quartz movement ensures it will keep going for a long time and there’s a fold over clasp closure that’s designed to hold sturdy. Just clip it and forget about it, other than to check the time of course. There aren’t a lot of additional features with this one but the basics are definitely being done right. 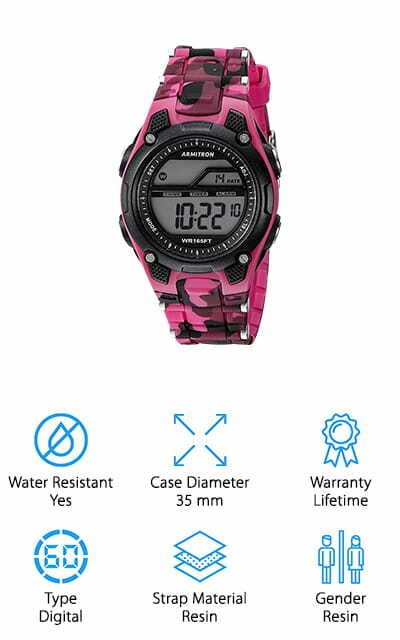 Water resistant to 30 meters, it’s designed for the rain and mild splashes of water. The all metal design helps to increase the style of the piece and the lightweight aspect and small size make it a good fit for just about any woman who wants something a little smaller to choose from. Here you’re going to get an inexpensive option, one of the best cheap solar watches for a watch that looks like it can do a lot (because it can). It’s a slightly oversized design to the quartz watch with a digital and analog watch face. It also has the ability for 2 different time zones and a 12 or 24 hour format. You are even able to use an auto calendar and the 1/100 second chronograph/stopwatch with split functions. There’s a snooze alarm and EL backlight as well. On top of all of that, it’s waterproof to 50 meters. With this watch, you can easily change between different modes, set everything that you need and get on with things you’d rather be doing. It’s durable enough to be taken with you on outdoor excursions but still stylish enough that you won’t mind wearing it for normal occasions either. This sleek watch is definitely ready for your next formal occasion. The watch is actually water resistant to 100 meters, which means it’s durable enough for the rain or even swimming in many instances, but it’s a whole lot more than that. The stainless steel design to the watch band and the elegant look to the interior of the watch face will make sure you’re not out of place at that special event. Once it’s fully charged you’re going to be ready to go for a full 4 months as well. There is a date window in the face of the watch and the analog display makes it super easy to read. You’ll have no problem with the lightweight aspect so you can wear it all day with no problem. If you’re looking for a new watch that will fit even your nicest occasions you don’t need to look any further than this. This everyday watch is inexpensive and has a large, easy to read face. Not only that, it has a backlight to help you read it even in the dark. The dual time settings let you keep track of the time no matter where you go and the process to change either is simple and easy. The date settings are also completely automatic, setting themselves for each month. With the silicone band, you’re going to be comfortable and enjoy using this solar powered watch. It even arrives in a stylish box that makes it great as a gift or for storage when you’re not using it. 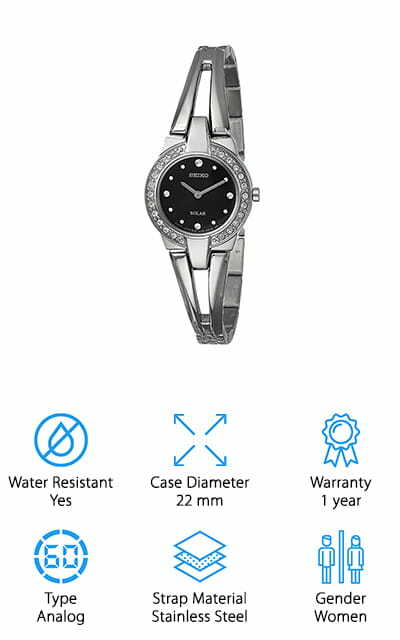 Great for your normal work day or your next special event, this watch is lightweight and offers a mineral window and chrome zinc alloy case. The small band is simple and the fact that it’s water resistant to approximately 27 meters is also a benefit during rain. The bright pop of blue in the face as well as in the backing of the band definitely add some fun to this watch. 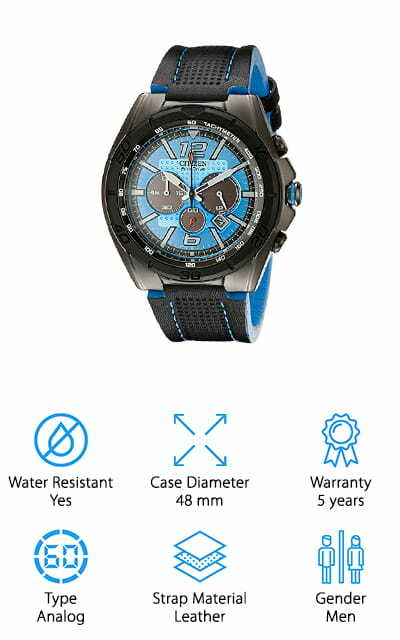 It uses black ion plated stainless steel with the blue dial and has a 60 minute chronograph. 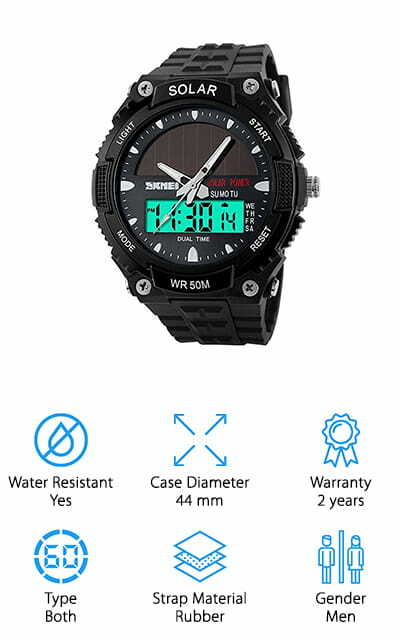 The watch itself is powered by mineral crystal and is water resistant to 100 meters, which means you can even take it snorkeling or swimming, though it’s not rated for diving. This moderately priced watch is powered by a company that’s well known in the watch industry. The 48 mm diameter and leather strap meant that it’s large enough and durable enough to withstand just about anything. You won’t have a problem wearing it for just about any occasion from casual to outdoors to even nicer occasion because of the classy design. Finally, we have our last option, which is an inexpensive choice with a unique and stylish look. It features a 12 or 24 hour format, a calendar, and 1/100 second chronograph/stopwatch. There’s a snooze alarm and EL backlight so you can see it even in the dark. The Japanese quartz keeps it moving properly and it’s waterproof to 50 meters, which means you won’t have a problem with rain or other minor instances with water. Coffee gold in color, this watch is 50 mm in diameter and ultra-lightweight. You’ll have both an analog and digital display as well as a rubber band that makes it comfortable and easy to wear while you’re out and about. With this watch, everything you need is right in the open and easy to adjust as you go.